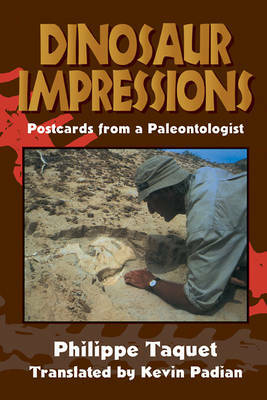 Dinosaur Impressions is the engaging account of thirty years of travel and paleontological exploration by Philippe Taquet, one of the world's most noted paleontologists. In this 1998 book, Dr Taquet takes the reader on a surprisingly far-flung tour ranging from the Provence countryside to the Niger desert, from the Brazilian bush to the Mongolian Steppes, and from the Laos jungle to the Moroccan mountains in search of dinosaur bones and what they have to tell us about a vanished world. With wry humor and lively anecdotes, Dr Taquet retraces the history of paleontological research along the way discussing the latest theories of dinosaur existence and extinction. Dinosaur Impressions provides a unique, thoughtful perspective not often encountered in English-speaking works. This insightful, first-hand account of an exceptional career is also a travelogue par excellence that will enthrall enthusiasts and general readers alike.